Leonard Cohen's upcoming appearances at Madison Square Garden will be something of a homecoming for this legendary troubadour, who once lived just around the corner. 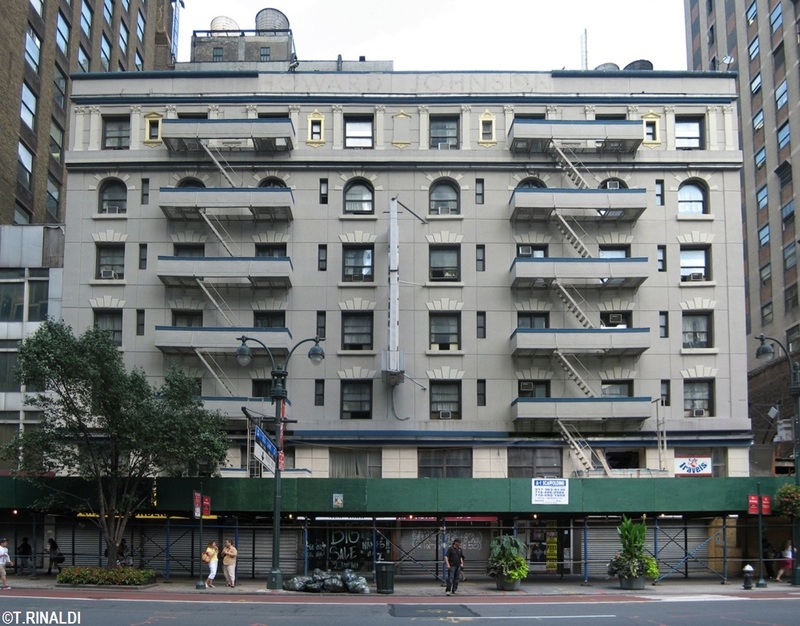 Though Cohen's stint at the Chelsea Hotel is better remembered, his first New York address was at 215 West 34th Street, at a forgotten place called the Penn Terminal Hotel. Forgotten, and now gone: the former Penn Terminal vanished just three years ago, having made way for a forthcoming 39-story tower that will house retail space and a new hotel (the retail stores opened for business earlier this year). 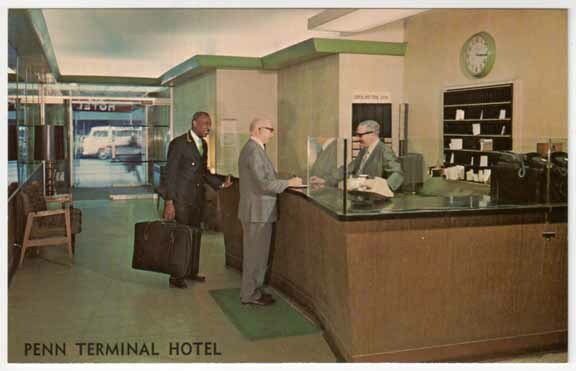 Checking in, checking out: The Penn Terminal's lobby c. 1960. 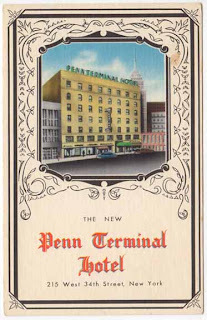 Another vignette of Cohen's stay at the Penn Terminal appeared on the liner notes of a greatest hits album released the same year. 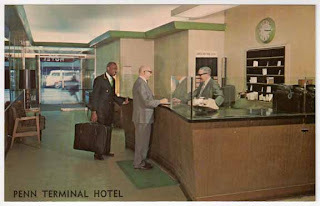 "This song arises from an over-used bed in the Penn Terminal Hotel in 1966. The room is too hot. I can't open the windows. I am in the mist of a bitter quarrel with a blonde woman. The song is half-written in pencil but it protects us as we maneuver, each of us, for unconditional victory." Memories of the hotel's bohemian backdrop seemed to stay with him through the years. "I don't want any of you to go there," Cohen remarked of the Penn Terminal at Wiesbaden in 1985: "It's not a bad hotel, but it's very very brown. Don't go there. If I see you there I will chase you right out of the lobby." 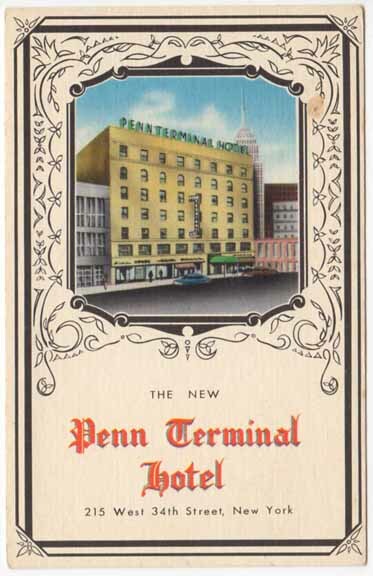 The Penn Terminal's big neon HOTEL sign may or may not have cast its red glow across the brown walls and over-used bed of Cohen's room as "That's No Way To Say Good-Bye" lay half-written. 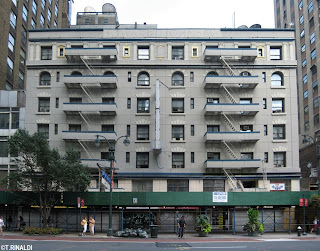 Some time after Cohen moved downtown to the Chelsea Hotel, the Penn Terminal changed hands and re-opened as a Ho-Jo. But the big HOTEL sign remained in place until the old girl finally ended its days at the Regency Inn and Suites in 2009. I remember the sign as a dim, flickering relic, glimpsed over my shoulder one evening a few years before the old hotel closed. 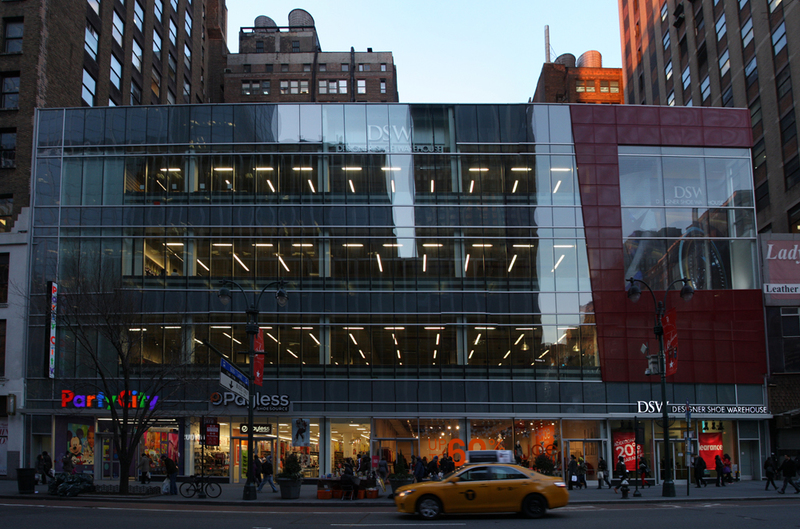 That such a thing could still exist in New York seemed incredible, and sure enough, its days were already numbered. By the time I went back with my camera, the sign had flickered its last. When the scaffolding went up not long after, I knew it meant only one thing. In New York these days, that's the way they seem to say good-bye, one after the next. *Cohen quotes by way of leonardcohen-prologues.com. • NYNeon featured at the Untapped New York Holiday Guide! Check out their other features at the link above.